Who are Scrufts and how did it come about? 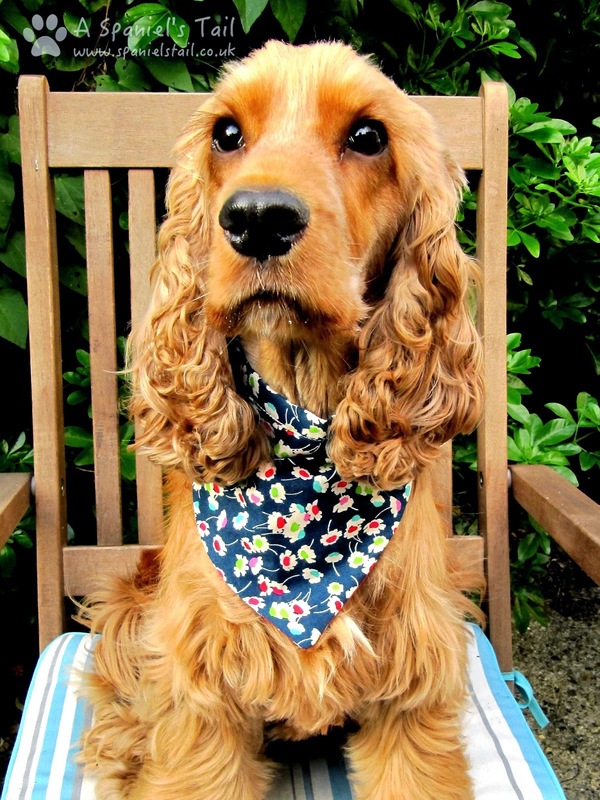 Scrufts is a small company run by the lovely Joy, specialising in the manufacture of beautiful quality collars, leads and bandanas. 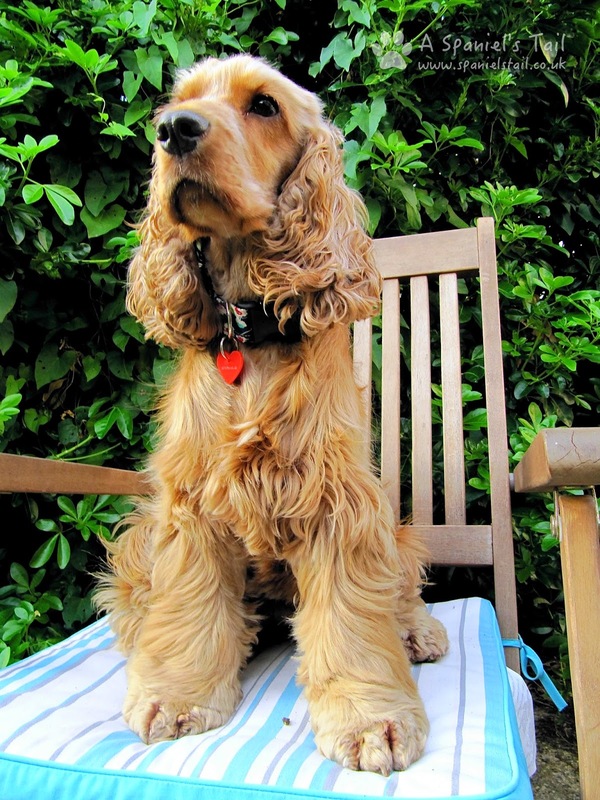 Based in Brighton, Sussex, the inspiration for Scrufts came from the Joy's two Sussex Spaniels, Maggie and Frankie (well, spaniel inspiration is always good!). Joy was disappointed in what was available to buy for her gorgeous dogs, so using her background in knitwear design, she set about designing a new range of collars and leads, using gorgeous fabrics crossed with strong functionality. 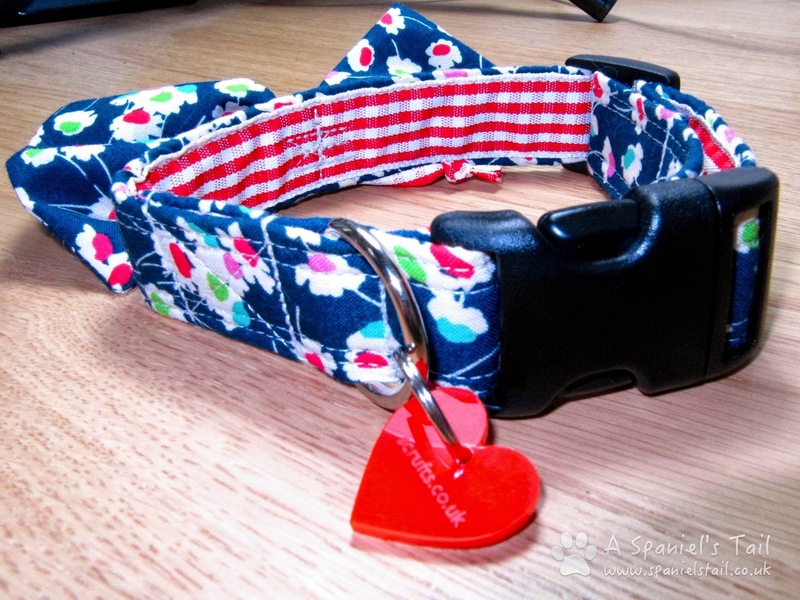 The range uses fabrics sourced from all over the world, including Liberty and British made tweeds, and all collars are finished off with a colour toned heart tag, all made to order and gift wrapped for you - truly a custom service for that special dog or dog lover in your life. What goodies did Scrufts send us? Hooman had great fun doing a photo shoot with me in the garden - she does have to use a few treats to get me to sit still for that long though! The item specifics and price are specified on each section and are correct at time of publication. 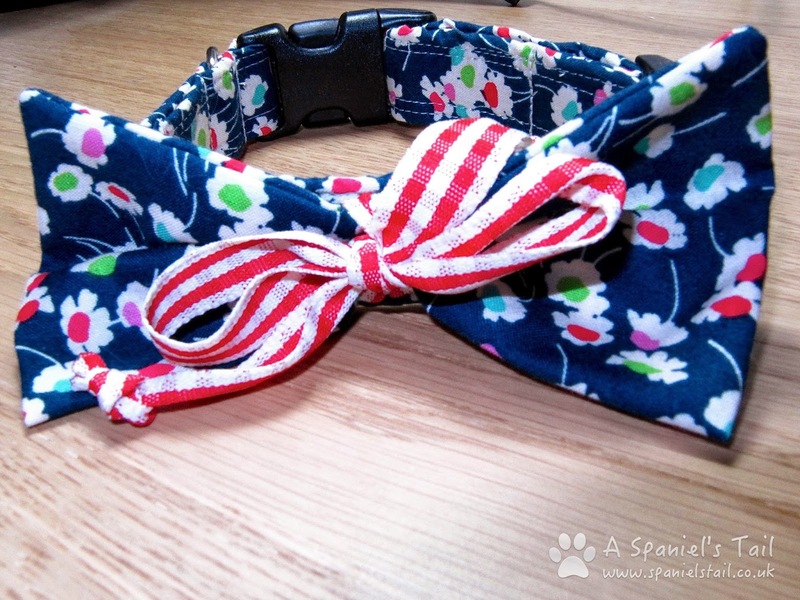 Quite possibly the cutest dog collar Hooman has ever seen, not only is this made from a gorgeous floral Liberty print fabric with a red and white gingham lining, it has the cutest bow tie on it! Although this isn't a collar that Hooman would let me go bog wallowing in, it is of a very strong construction built on a high strength webbing core, and a very sturdy buckle. 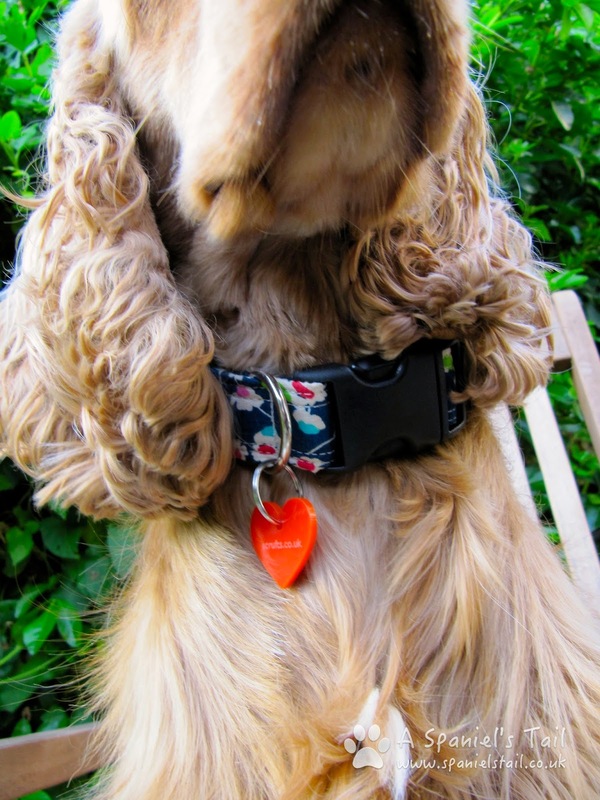 We also love the little heart tag that is added to all collars in the Scrufts range. This is great for the more social events that you may take your dog to (weddings, parties, pub gardens etc) where you still have the security of a strong collar, but a very cute and eye catching design. Hooman loves this lead and was slightly annoyed when I slobbered all over it on our first outing with it! 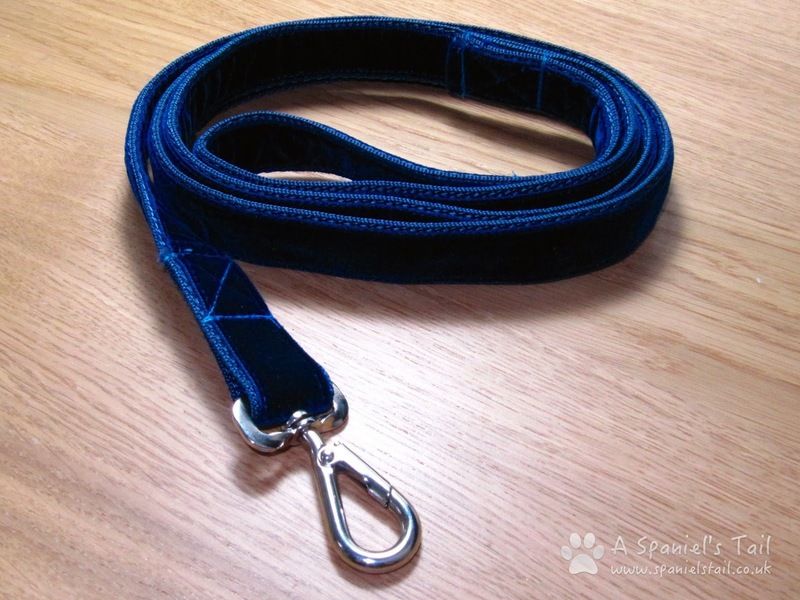 The lead is a gorgeous deep blue velvet, an inch wide and is structured on a strong webbing base, which makes it supremely comfortable to use, strong, and great if you love touchy feely fabrics like the Hooman does. She loves the fact that this particular choice is longer than most as well - that extra foot or so makes a huge difference when out and about - great for trips to the pub garden! 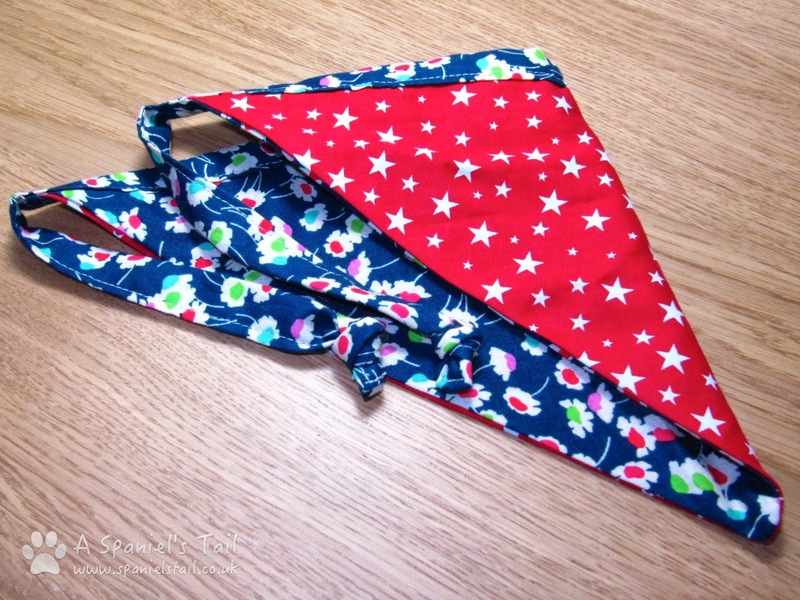 Now we couldn't find this on Scrufts website, but Joy included this very cute bandana in the parcel she sent us. 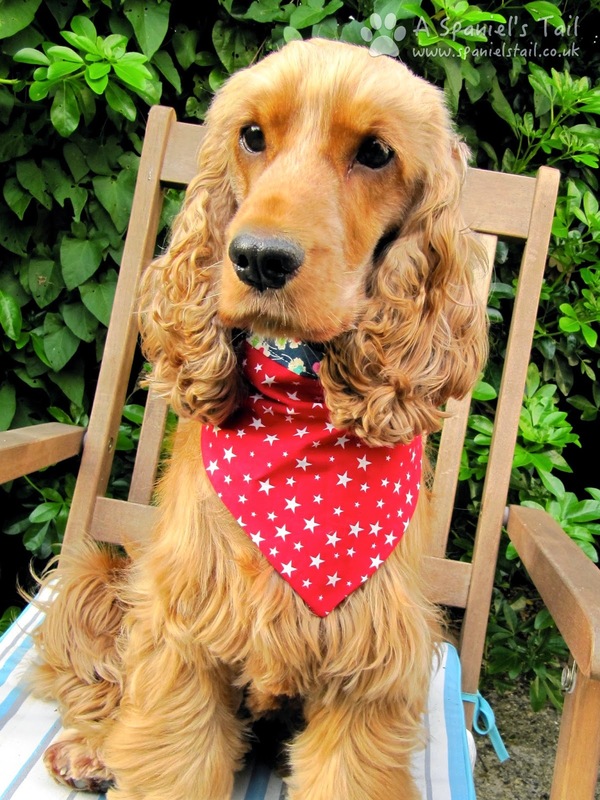 On a little digging around the interwebs, we found some samples on the Scrufts Facebook page, so can only hope that this is something that she is planning on selling very soon - Hooman has not put me in a bandana before but she thought this looked lovely on me, and this was two bandanas in one! One side the same gorgeous Liberty floral print of the collar, and the other side a contrasting white stars on a red background. 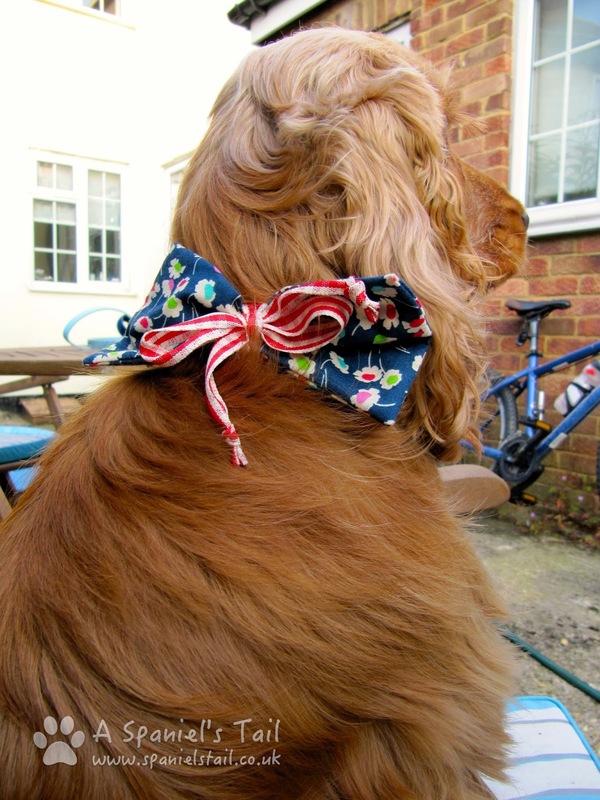 This would be a stylish way to make your dog stand out from the crowd - and on a practical note, on sunny days they are great for keeping the sun off your dogs neck, and can be dampened for an even better cooling effect! We were very impressed with our review items - they are fantastic quality, we love the quirky bow tie design, the velvet lead is a joy to use and the fabrics are just lovely. We think these would make great gifts for your dog, dog loving friends , or, if you have the same collar addiction as Hooman does, yourself! 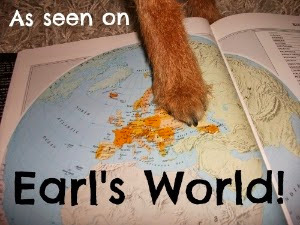 Top Barks for you Scrufts! Browse the full range of Scrufts products here. Looks like some cute stuff! I can highly recommend Scrufts products being an avid customer!! The goods are of the highest quality, beautifully made and also very functional and hardwearing. They also wash very well. The materials used are stunning! Very difficult to choose which is why I have countless collars, leads etc for my dogs! Very cool looking. We love collars, but fabric collars wear out really fast with us, and we tend to get them dirty a lot, so these might be too nice for us "dirty dogs". I could totally see the fanciness when we get all dolled up for a party or holiday...special occasion! Whoa, very sophisticated. You could wear that velvet lead to your next formal event. I absolutely LOVE the bow on that collar and the colors!! The colors are awesome. I'm always looking for something cute for Delilah to wear because she is such a beautiful girl. Very pretty for fancy dressing up occasions. I had to laugh at the slobber on the pretty leash. That would happen around here for sure! 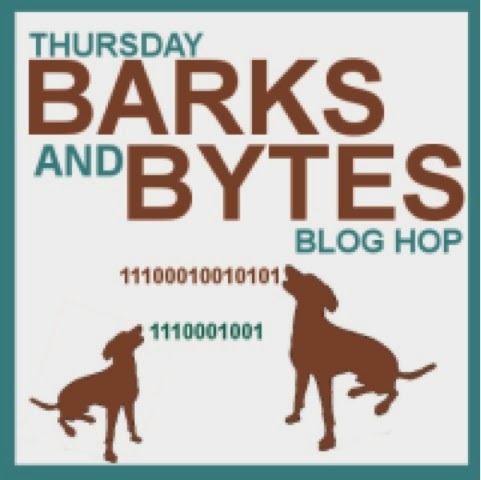 Thanks so much for joining the Barks and Bytes hop! Very fancy and modelled beautifully Lottie. The velvet lead is well special. Have tremendousThursday. What an adorable collar! I love the way the bow stands out, because sometimes the design of a collar just gets lost in all the dog's fur.